Investor Relations section of KREF’s website at http://www.kkrreit.com/investor-relations/events-and-presentations. 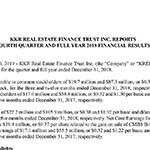 posted to the Investor Relations section of KREF’s website at http://www.kkrreit.com/investor-relations/events-and-presentations. about KREF, please visit KREF’s website at www.kkrreit.com.